[Fire | Arcane | Frost] Weakauras 7.0.3+ - Altered Time - your #1 World of Warcraft Mage resource! 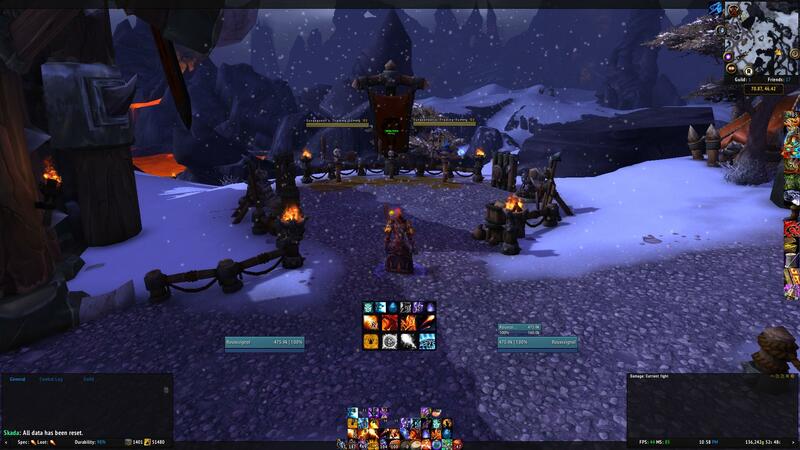 A Small Update with some new utility stuff for questing, leveling and dungeons. - The optional visual for the indication when you are standing in your rune is now in the general frame. - Improve and get better timings, with everything focused in the center you will be able to make better decisions on what to cast next. 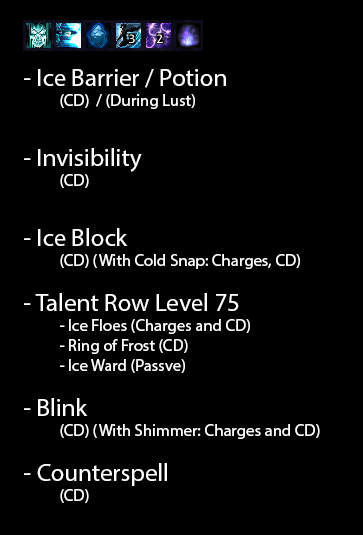 - I use those WA's to hide my actions bars so it tracks all important CD's, Buff and Debuff. 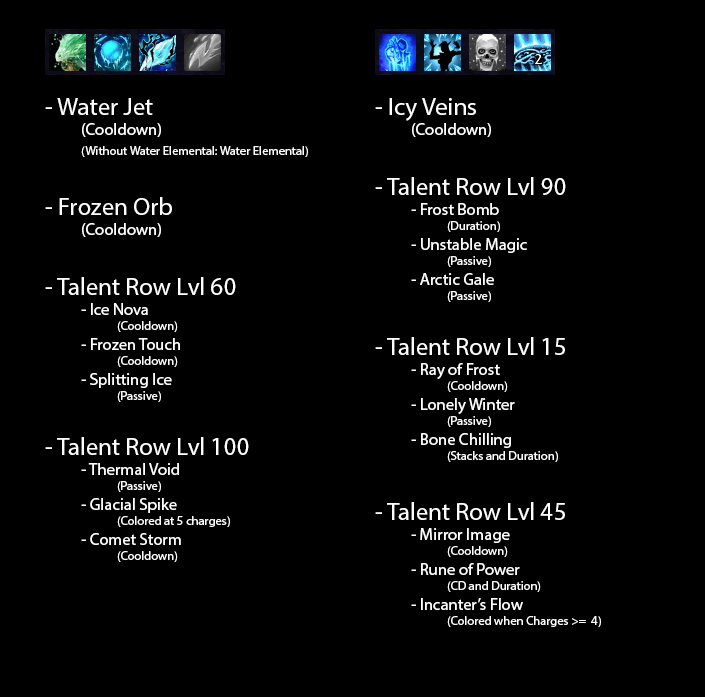 Most talents are supported (some less used on some class got left out for the sake of keeping the "template" clean over all classes. - Aimed for PVE and raiding especially. With all the information in the middle of your screen under your character feets it's perfect to see fire and avoid it and you don't have to go look at your debuff at the top right of your screen or at the bottom to see when certain spell is coming off CD. 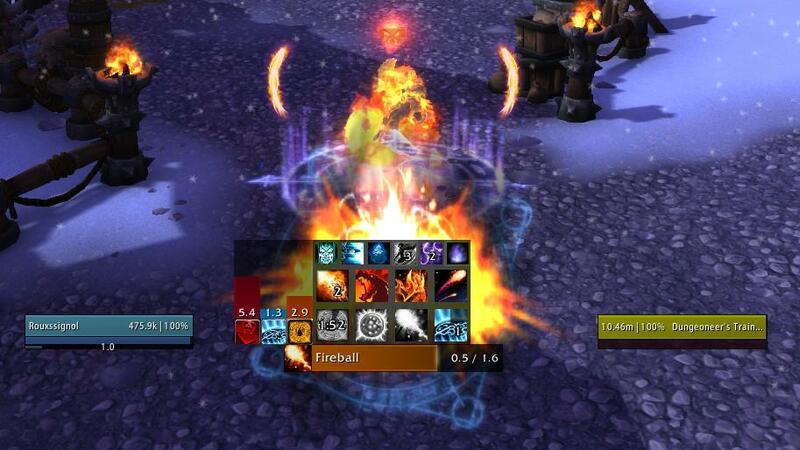 - The "Goal" for those Weakauras is not to tell you what button to press but instead help you make the right decisions. *General and Timer Bars are required on all specs. October 2016 - Sorry but there will be no more update. I stopped playing the game, if anyone want to keep updating those feel free to do and I'll be around from time to time to answers questions if there's any. - Make sure you have the skin: Dream. - In the color options set the background opacity to 80. If you have any issues or request feel free to PM me but I cannot guarantee that I will do every request. Last edited by undsk8 on Mon Oct 03, 2016 1:58 pm, edited 10 times in total. Updated with all specs and better presentation. 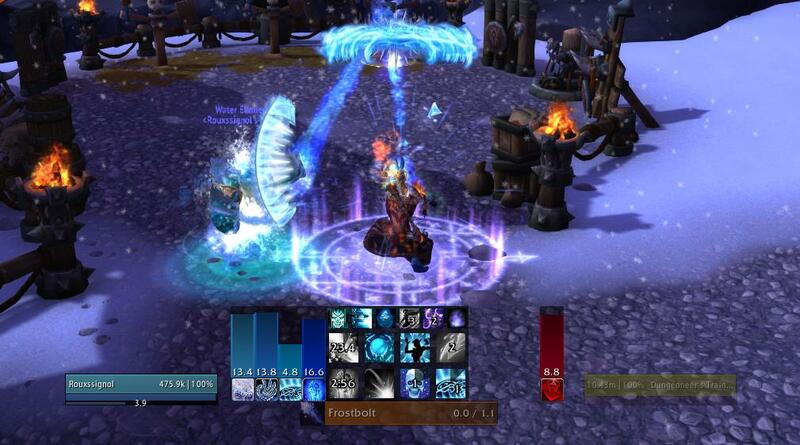 Hey, these Auras are awesome! 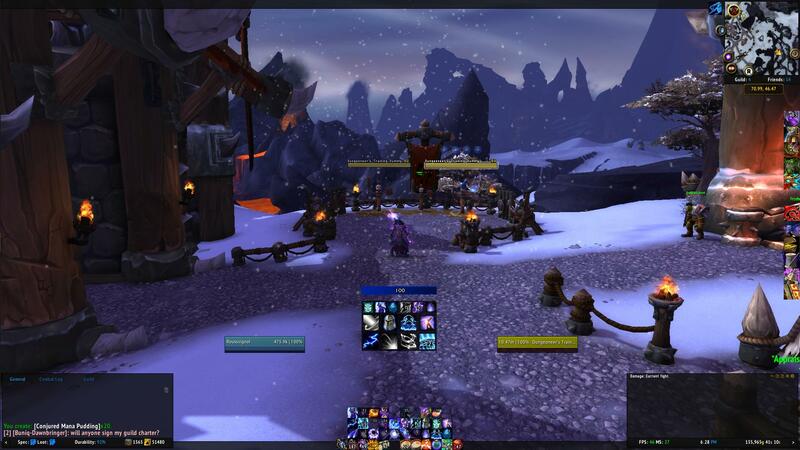 I have a Sticky on the official german forums where I made Auras for WoD. I don't have a lot of time at the moment and people want the new auras. Can I use your work to change and share with the german community? I will give you and altered-time full credits for this. Sure go ahead I'm doing this for the community so share it and if you do changes or anything feel free to add them to the post so people have options to choose from. First of all, thanks a lot for that weakaura, it's simply amazing. I have a question though, how could I hide it whenever not in combat? Go to the "Load" tab and click "In Combat". Updated the main post with a small update. 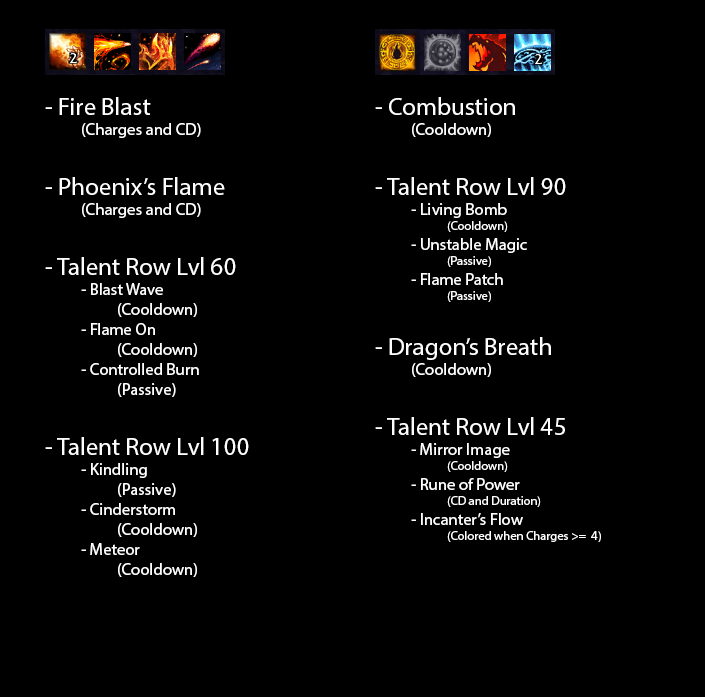 Komma already have an Ignite Weakaura updated for legion, here's the link. But if that's not what you are looking for give me more information on what you want exactly? Like do you want a timer bar telling you if your Ignite is on the target? Or a frame with the remaining duration on all target that the debuff is active? 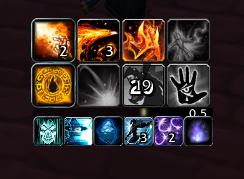 I installed WeakAuras just for the fire mage one, but it seems I have two cooldown timers when I cast a spell. It has the larger one with the clock rundown and then another more in-the-center on counting down on top of it so it makes it hard to read the number, since they are on top of each other. Any idea how to get rid of one? I got rid of the larger one by disabling cool down on "Dragon's Breath CD" but that's the one I want to keep. Not sure how to get rid of the smaller, more centered one. If that doesn't work it might be another addon that have a similar function. 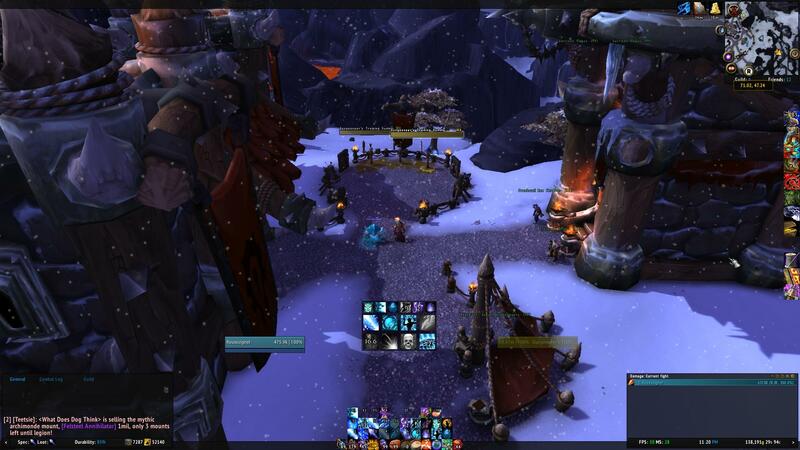 Also make sure you read "Weakauras Visual" at the bottom of my post if you want them to look like in the screenshot. It was the option in the Action Bars interface. Thank you! With RoP now having two charges, is it possible to create a WeakAura to let me know how many of the 10 active seconds remain? The RoP buff does not have a timer and it is difficult to tell when it ends. 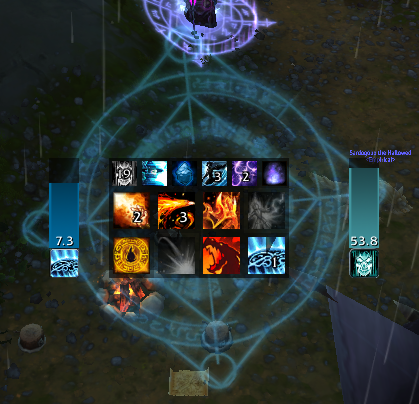 I know the cooldown is displayed on the action bar, on the spell itself, but I would like to have it as a progress bar. How do I do that? I have tried creating it myself but I did not manage to come up with what I wanted. With RoP now having two charges, is it possible to create a WeakAura to let me know how many of the 10 active seconds remain? I have such a timer in my weak aura set but it will retrigger the 10 seconds on the bar if for some reason you run out and in. Auras are at (https://gist.github.com/lichtschlag/344 ... 9a5afb52db" target="_blank). 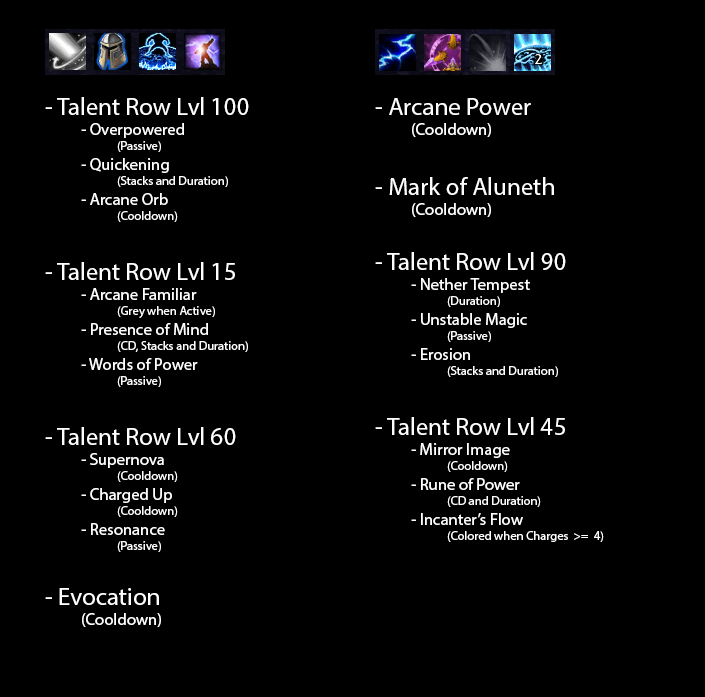 Salvage them for the Rune of Power, the rest is pretty outdated. I'm a bit confused about the issue because at the moment in the weakauras you have the duration of the buff (the timer on the left with 7.3 seconds remaining) this timer will be there even if you are not standing on the rune. Also you have the rune background to tell you when you are standing in it. Make sure you have took the timer bars string also if that timer isn't there and if you have them and it still doesn't shows up or that's not what you mean tell me and I'll try to make it. 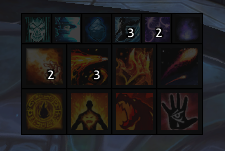 Loving the weakauras but I'm having an issue where all of the icons display as dim (see the image below). Any idea on what might be causing this? 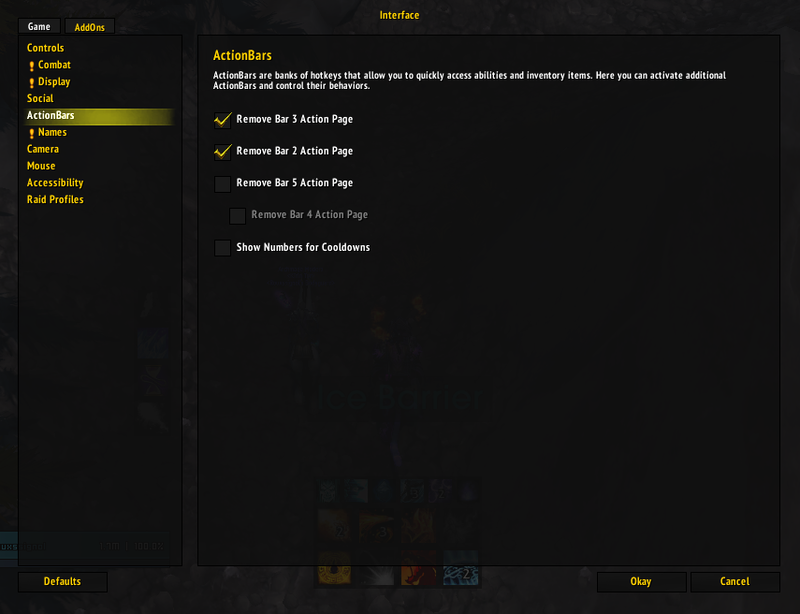 Try disabling addons that you have that could affect visibility maybe elvui or masque just to see if it's related to addons? *Edit* Looks like it is just me, think it maybe another addon or corrupted somehow. Thought I would see if anyone else is having the issue or perhaps I have a .lua issue.